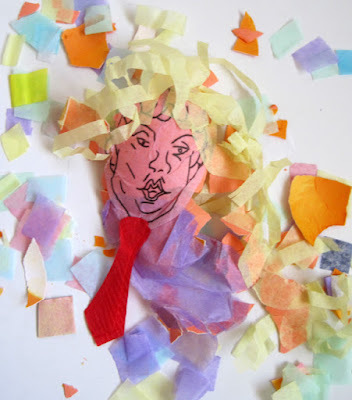 "Cascaron" literally translates to "eggshell," and in Mexico the term "cascarones" usually refers to eggshells filled with confetti — popular at Easter, New Year, Carnival, and just about any time you want to smash an egg on someone's head or back to cover them in confetti. They are now popular in various countries throughout Latin America. Smashed Trump cascaron with confetti innards spilling out. 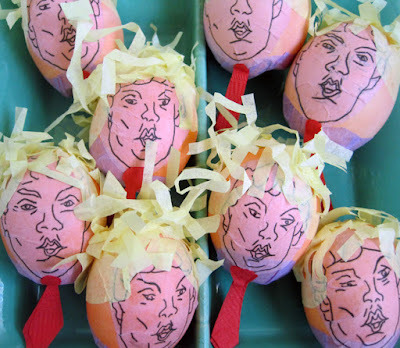 I decided to make a batch of Trump cascarones for this Easter, though it occurs to me that these would be a welcome addition to any protest march as well. 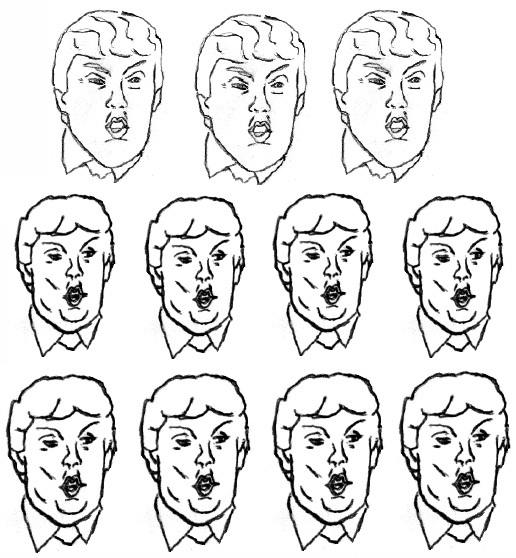 I have included detailed how-to instructions below, along with a template of Trump faces so that you can crank out your own cascarones. 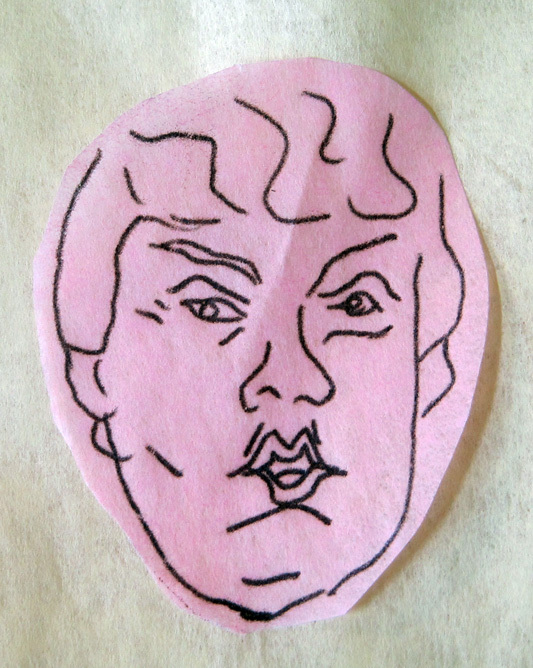 Throw a Trump cascarones get-together and make a ton of them. 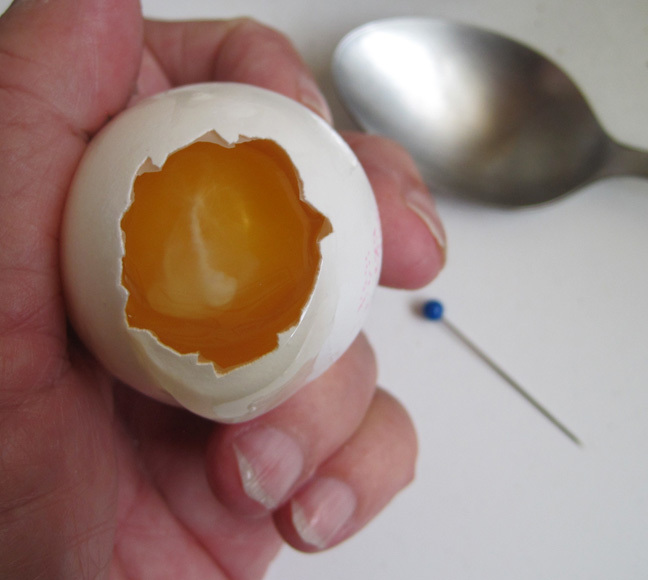 Begin by tapping the end of a raw egg with a spoon to just start a crack at the smaller end of the egg. 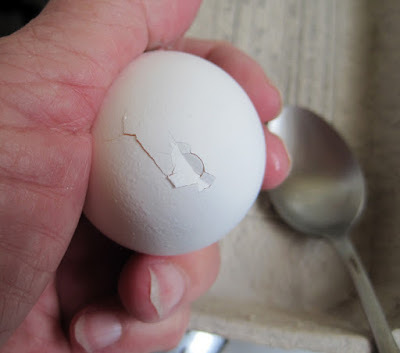 Use a pin to carefully lift away egg shell from that end. 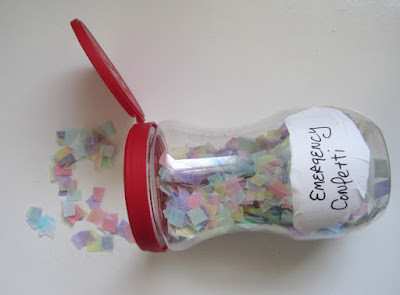 You want an opening large enough to easily insert confetti. Use photo below as a guide, but this isn't an exact science. Pick and lift shell pieces away with a pin. 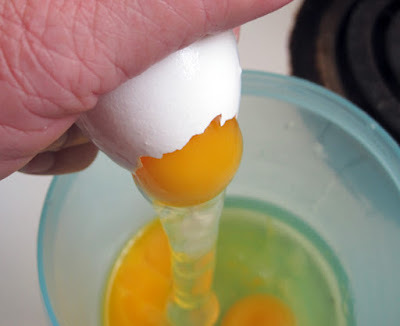 I simply turned the raw eggs over and shook them into a plastic storage container. The yolk sort of plops its way through the opening, and it doesn't matter if the yolk breaks. Save the eggs for a cooking project. 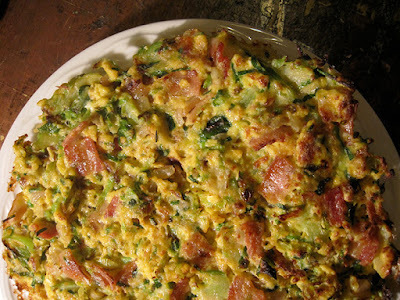 Save the egg innards and use them later for cooking. A friend of mine from San Cristobal de las Casas in Mexico refers to Trump as "the orange man" due to his perpetually bizarre skin tone, so of course I went with orange dye. Around Eastertime you can pick up Easter egg dye. I had food coloring on hand, so I just used the formula given on the food coloring box to create orange. 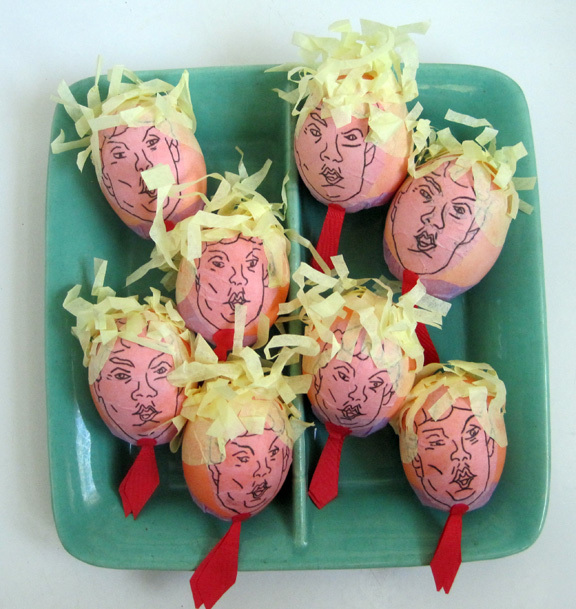 Wash your eggs and then dye them and let them dry. 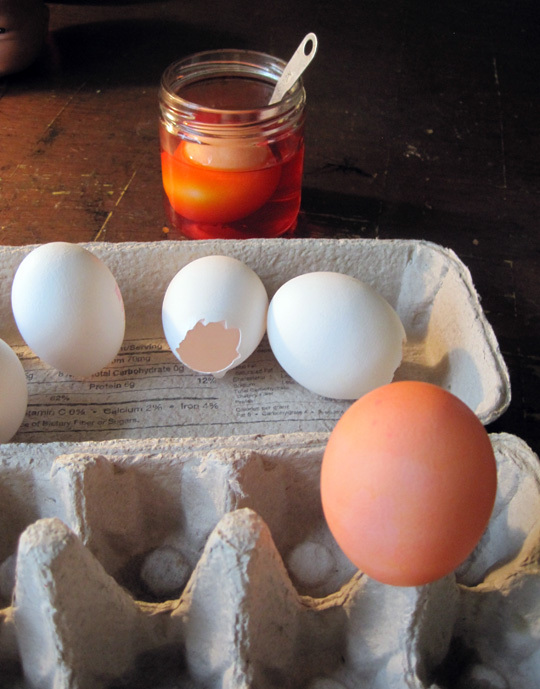 I used the egg carton as a drying rack, but you can also just turn them with the opening down on a paper towel to dry. I had a hard time finding paper confetti — all that I found available commercially was horribly eco-unfriendly metallic confetti. As an alternative I bought a huge, multicolored pack of tissue paper at the Dollar Store and made my own. Just cut narrow strips through a lot of stacked layers of the tissue paper, and then snip those strips into tiny pieces. I had planned to use a makeshift paper funnel to pour confetti into the eggs but as it turned out, I was able to just pinch bunches of confetti between my fingers and stuff the confetti into the eggs. Stuff them fairly full. Cover the opening with a piece of blue tissue paper. Just eyeball the size of your openings and cut circles of tissue paper larger than the opening. I used a glue stick around the edge of the tissue paper circle and then pressed the circle in place. Note: Do not smear glue over your entire circle, and in particular you should avoid getting glue in the middle - you don't want your confetti adhering to the tissue paper. 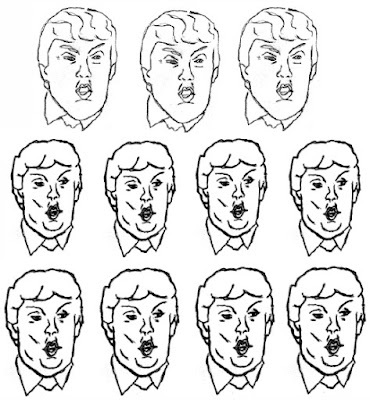 Download, print, and use the template below to create the Trump faces. You'll see there are two versions - pick the one you like or use both (I did). 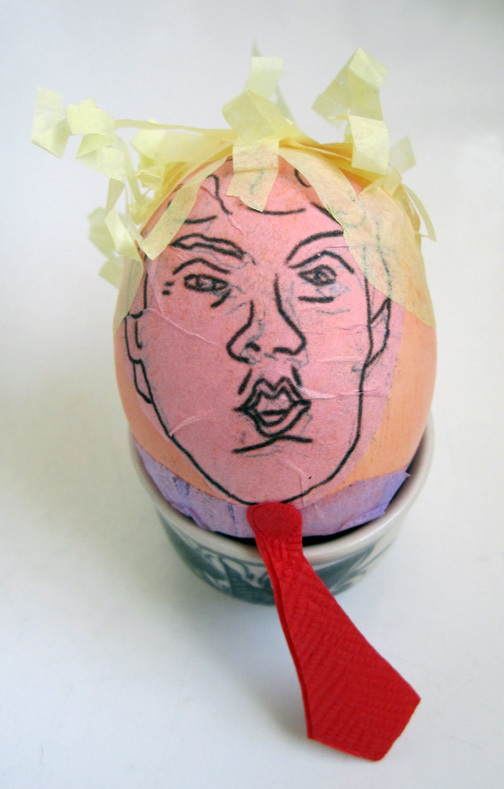 Cut around a Trump head as shown below. Use a similar-size piece of carbon paper and some pink or orange tissue paper from your multicolored pack of tissue paper. I always have carbon paper on hand. If you don't, you can get some at any office supply store. Use a ballpoint pen to go over the lines on the Trump face and transfer that image onto the tissue paper. Ignore the very top of the head and the collar/tie at the bottom. Don't transfer those (see pictures below). 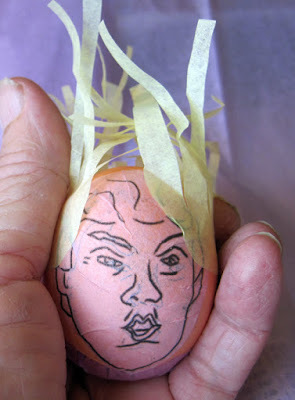 Trim and use a glue stick to affix the face onto the egg. 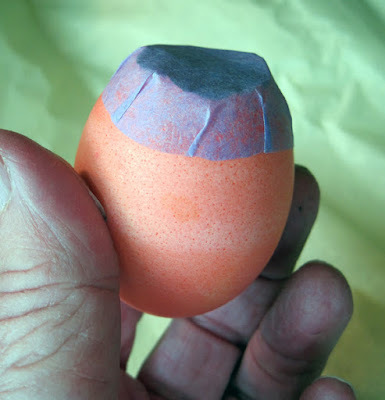 It will wrinkle a bit because the paper is flat and the egg is a three-dimensional oval, but you'll find that the wrinkles just press into place and the whole thing works. 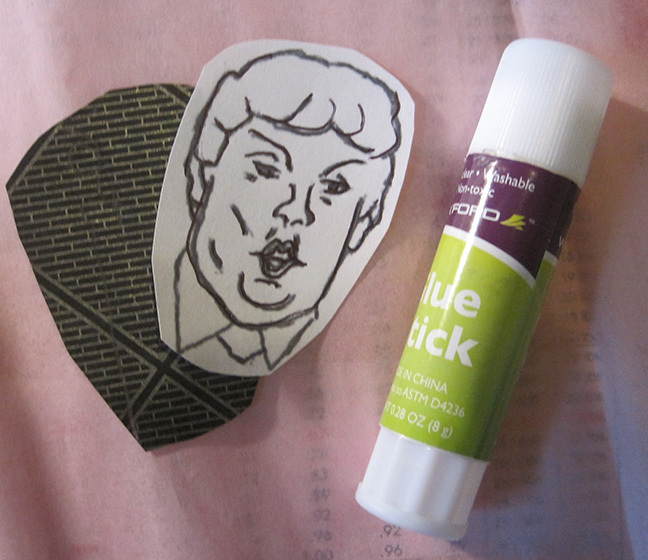 Important: The chin should be down near the blue tissue paper covering the opening (see below). As this evolves, that blue tissue paper becomes his suit. Using yellow tissue paper, cut three shapes like the one below. Start by cutting an oval, then snip into the oval at one end as shown. This is going to be his hair. Just eyeball the size. The picture following this one should help you see how this works. 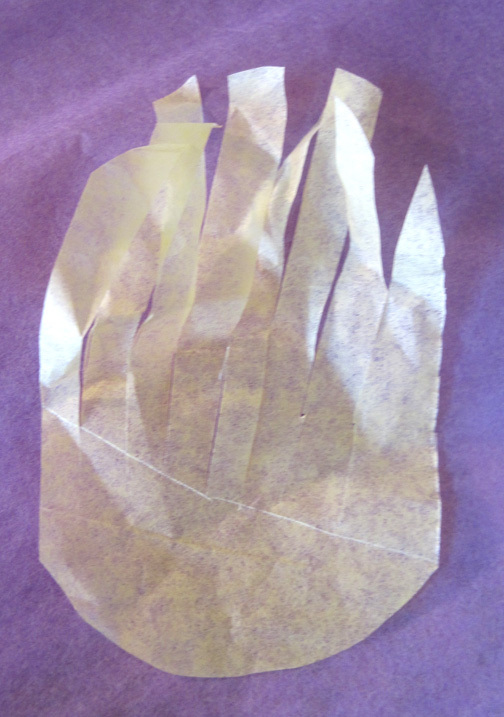 Cut three pieces of yellow tissue paper like this. Glue the three yellow hair pieces around the sides and back of the egg as shown below. 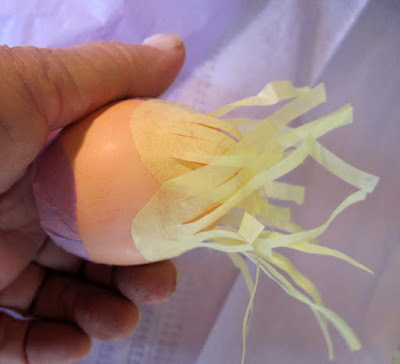 Glue yellow paper to egg sides and back. 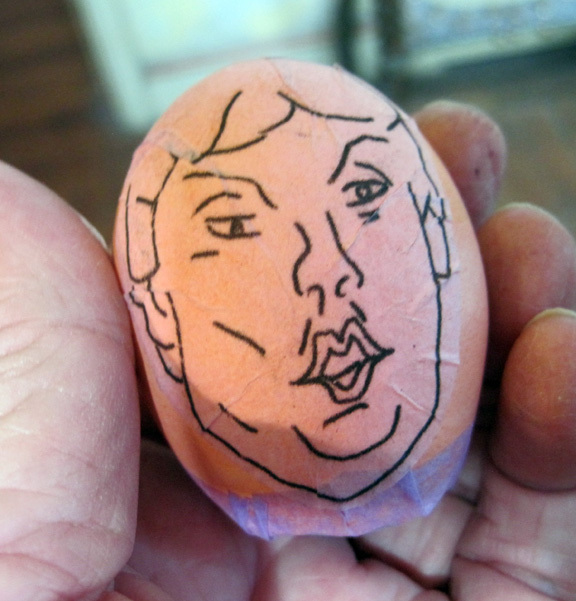 Now just crumple the hair with your fingers. There is no wrong way to do this. Then put little dabs of the glue stick on top of the egg and press various ends of the hair down to create comb-overs. I like leaving a lot of the hair loose and wild, like a bad comb-over caught in a wind storm. Crumpled hair, and an added tie. I realized at this final stage that a tie (red of course) would complete the cascaron. I had some red napkins on hand, and just cut out little two-layer ties freehand. You could also use red tissue paper. And there you have it — a batch of Trump cascarones. Can't wait to smash them. If you have a minute, I’d really appreciate it if you took a look at Emily’s Virtual Rocket. This is a serious newsblog which has been taken from e-newspapers and e-magazines from around the world, with an emphasis on transgender issues. Also, with his election, I look for articles which critique Donald Trump. If you like it, please consider putting it among your favorite blogs. I would greatly appreciate it. Emily - I restrict my list of favorite blogs here to art and textile blogs. But happy to allow your post above if others are interested in pursuing your blog. If you know anyone who works in the gov't ask them for some shredded documents; there are always shredders in the Business Centres (supply rooms) in gov't! Great idea! And perfect for Trump cascarones. Christine Mauersberger: "What's good to look at now"